I've put Sunday back into the poll. Morsey can't make it but it seems Steve and Niall can. It looks as if there is more chance of doing this tomorrow, so I will show up on T/S then. Have a good game today guys. I tried the link to download the map and had no luck. Is there a better link or does it already come with nappy mod? Yes the map is in the KS SOW Supplemental maps. You do not have to download the 10 mile mod. It looks like game time is at 19:00GMT today. Sorry guys. I think I'll struggle to get there before 19.15-19.30. Is that ok with the rest of you? Everyone can also make it at 19:30GMT so it shouldn't be a problem. Been watching the replay and it looks to me that around 11:15 am Hay's division gets attacked by Wittman's. There's definitely some French infantry getting stuck in and a French cav sqn appears to have a go at some Austrian guns so maybe the points scores we had at the end of last night should stand? Part one of the battle saw an attempt by both armies to move to destinations well beyond their start positions. Both armies managed to concentrate their separate division along the NW-SE axis of the map at the end of the morning. 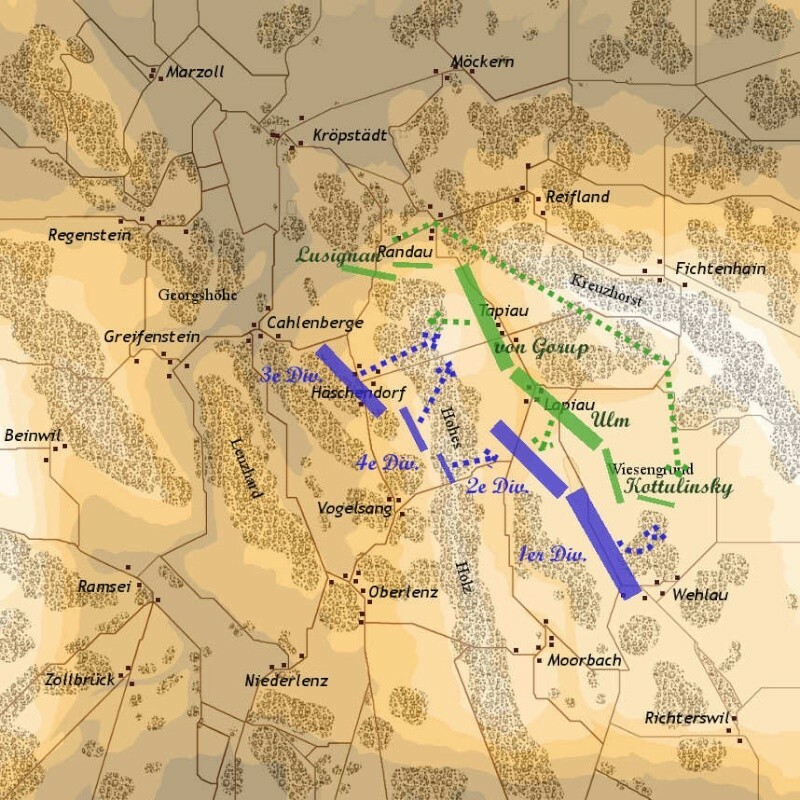 The western most divisions of both armies sent their cavalry to Greifenstein. There they faced off, grimaced at one another and allegedly made rude hand gestures. However, after a while both sides bored of the meeting and parted ways. In the east, two divisions of each side met near Lapiau. In this case the use of salty language by both the French and Austrians was reported, but little fire was exchanged. Casualties were light caused mostly by artillery fire. Apparently the French became insulted and marched back to the south when some Austrians turned, dropped part of their wardrobe and made a rather insensitive display. The Austrian officers need to rein in such boorish behavior. 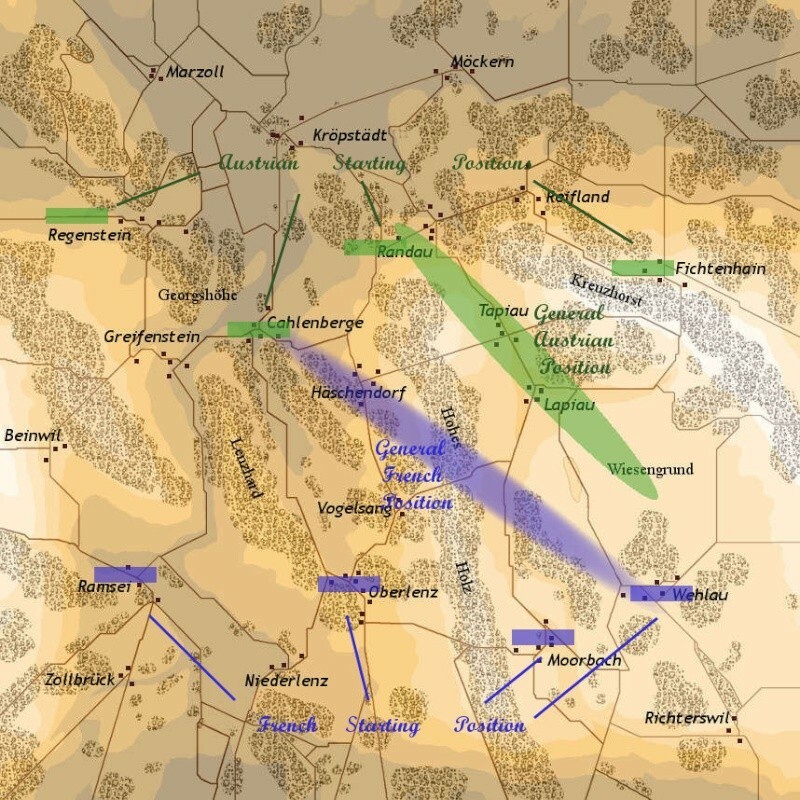 In the center, two divisions stumbled into each other in the area between Cahlenberge and Haschendorf. There was a sharp exchange, resulting in minor casualties on both sides. The two divisions then withdrew as if by mutual consent. During this skirmish, two German squadrons attempted to ambush a passing column of Austrian light cavalry. This was repulsed with the Germans being hotly pursued and eventually captured. The battle will resume at a point three hours later. Both armies have adjusted their lines and for the most part and withdrew from direct sight of one another. The general location of the French and Austrians is shown on the map. Since it does not appear that we will have a Peninsula battle this weekend, I have put up a doodle for part 2 of this scenario, the blood bath. As usual, the times are for BST. Isn't it the same right now? I really like the concept of this game, Kevin. I am free to play this weekend . Wondered if you considered putting this up on the NSD site? I'm sure Davinci would be chuffed, if nothing else. It's GMT right now. BST just doesn't exist at the moment since it isn't 'summer'. I'll be up for continuing the role of the Austrian C-in-C so let me have the details when you're ready. Updated briefings to both CinCs have been sent. I'll put a link to this thread on the NSD site. Maybe someone there will see it and want to play. Looks like we will shoot for the usual 20:00 GMT. Numbers are still looking tight. I hope we get some 'passing traffic' on the night. This game is 3:30 EST time correct? What do I need to play? I downloaded everything linked.. Is there a teamspeak link or something to that effect? I think 3pm is correct (5hrs difference), presuming we start at 8pm GMT. A little earlier if poss, especially if we need to test your set up first. The scenario was loosely based on the opening moves in the Austrian 1809 campaign which found the French army in a precarious position. The overall goal of the French army was to throw back the Austrian vanguard corps and take up a blocking position against the rest of the Austrian army between Cahlenberge and Randau. Slowing the Austrian advance would allow the two other French corps sufficient time to concentrate farther to the south. The Austrian mission was to spearhead the advance. They had to break through a severely over extended French corps and take up a position between the other two French corps in the area between Moorebach and Wehlau. They were also tasked with the need to keep the Austrian army's intended line of march open so there would be no delay in their concentration and taking up a central position. Part two of this scenario saw both armies fight over a very extended distance stretching between each army's strategic objectives. It turned into three separate battles. In the north the French 3rd division, (Wittman) and von Gorup, (Josh), engaged in the woods between Cahlenberge and Tapiau. It became a standoff until the bulk of the French 4th division, (Ron), joined the fray and von Gorup was forced back. In the south, the fighting was confined to a long period of counter battery fire until Lusignan's, (Niall) division made the long trek from Randau to the woods north of Wehlau. Then the fighting there began in earnest with the combined divisions of Kottulinsky, (Martin), and Lusignan wading into to the French 1st division, (Steve). In the center, the last two divisions to engage were those of the French 2nd division, (Mike) and Ulm's, (Kevin) division. The fight for the this ground south of Lapiau was a standoff, with neither side making much headway. The end of the battle had the French in control of the region between Haschndorf and Tapiau. The Austrians were not far from gaining complete control around Wehlau. Both armies could be said to have nearly achieved their strategic objectives. However neither side had achieved anything like a knockout punch against the other. Both armies were very much intact, each suffering approximately 11% casualties. The decision is a draw, but I would imagine both corps commanders will receive a dressing down from army command. The battle showed both sides exercising great restraint in their use of cavalry. It seemed to be used mainly as a threat weapon rather that being turned loose on the field. That was a huge departure from most of our games where the tendency to use that arm early is the norm. This fight was much more in keeping with battles of this period. Since it was such a potent force, hovering just in the background, the fighting between the infantry was restrained. Overall, it was an excellent battle. The CinCs did a very good job maneuvering their forces to achieve their assigned objectives. The division and brigade commanders did a good job fighting their troops but not destroying them in hopeless endeavors. Thank you for this excellent scenario, or 'mini-campaign'; its been one of the best our group has played I think. The 10 mile map with its open vast plains is a fresh departure to play on and I really liked it. This map can give great scope for other battles using only part of it's area and we should use it more, I think. The combination of two evenings play with a scouting scenario first followed by a main battle scenario was an excellent piece of design and I think it brought out well the primary elements of Napoleonic combat. At the end of the scouting phase I was very confident that we could win the coming battle. I had what I thought was a simple and sound plan that covered all the bases and gave us a potentially winning attack in the south. Its only flaws were that Lusignan had such a long march - though in the end he arrived in perfect time, exactly on cue to turn back the French 1st Divs cavalry sweep around Kottulinsky's left. The second variable I didn't account for was the high spirits of von Gorup who interpreted my forward hilltop position west of Tapiau more liberally than I did with the result that he got himself almost completely detached from Gen Ulm's right and was slowly being overwhelmed at the end of the action despite my several pleas to him to disengage and move south to reassume contact with Ulm's division. It was something of a shock to get a message from Ulm late in the day when no reserves were left that his division was fighting two enemy divisions and he needed support! Given that his division was huge at 18,000 men I wondered how big was the enemy he was fighting such that he needed help? I also knew from von Gorups increasingly desperate notes that HE was fighting two enemy divisions. It left me wondering how many divisions the French had since Lusignan and Kottulinsky were fighting another! As always with HITS games the fog of war made this game, the enormous distances only adding to that. I would like to say that this game felt more like a Napoleonic battle than any I've done before with SoW mainly because all formations were well spaced out with huge amounts of room to manouvre. Well done Kevin; great game!